Brother Jesse Blog: One-on-one with Nation of Islam painter Sister Shernett Muhammad:"We are the best, so we have to put out the best"
One-on-one with Nation of Islam painter Sister Shernett Muhammad:"We are the best, so we have to put out the best"
Painting:"Seeded Minds: Year of the Farm"
Brother Jesse Muhammad (BJ): At what point growing up did you realize or recognize that you had a gift for art? Shernett Muhammad (SM): Well, I don't know if I recognized it immediately but I started drawing figures and portraits at or around 12 years of age. Of course it was not to the extent that it is now, it was just stick figures. My sister recognized that I loved drawing and she started showing me how to draw the human figure to make it look more realistic. It wasn't that great then but it was an improvement. It was another dimension added and it kept evolving. I kept getting better overtime as I used magazines and photographs to practice and to learn how to draw the human figure. BJ: Are you originally from Miami? SM: Originally I was born in Jamaica. I live in Ft. Lauderdale, Florida and I attend the Mosque in Miami. BJ: Let's talk about this magnificent painting. When exactly did Student Captain Sandy Muhammad approach you about doing the image and what was the concept that she gave you originally that she envisioned for the picture? SM: She approached me about four months prior to Saviours' Day to do a painting for Mother Khadijah Farrakhan of the M.G.T. engrossed in study, surrounded by the books of the Honorable Elijah Muhammad, the books of the Honorable Minister Louis Farrakhan and so forth. She wanted books everywhere she explained enthusiastically. It would be a Saviours' Day Gift to Mother Farrakhan on behalf of the M.G.T. So I went among the M.G.T. thoughtfully selecting sisters for the painting. I didn't want to select sisters at random based on the fact that this one or that one would look good in a painting. 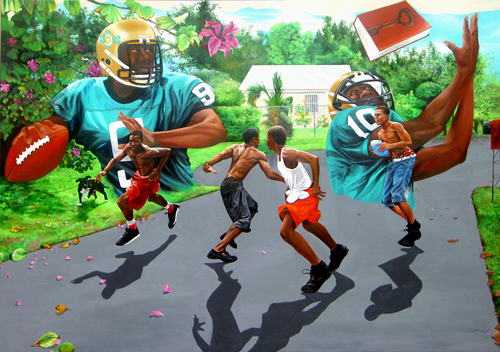 I thought that those who would be in the painting should be truly committed to the study and culture of the Nation of Islam and that their pattern and conduct had exhibited that devotion over a period of time. 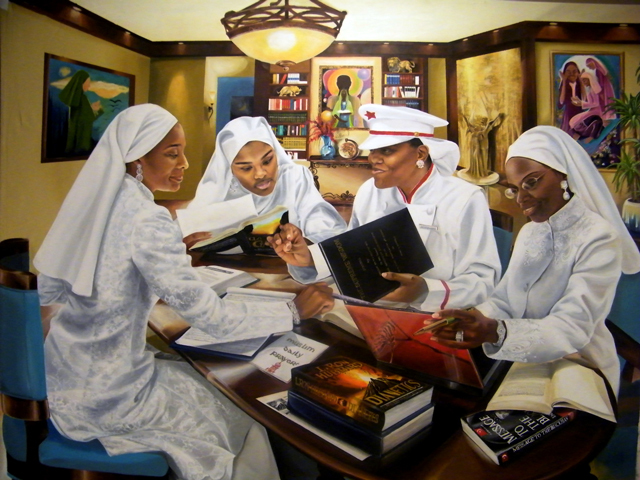 The sisters in the painting from right to left are Sister Rosalynn Muhammad, Sister Muriel Muhammad in Vanguard Uniform, Sister Amirah Muhammad, and Sister Pauline Muhammad in lace uniform; each from Mosque No. 29 in Miami, Florida. Anyone who knows these sisters know that they are truly studious and dedicated individuals. 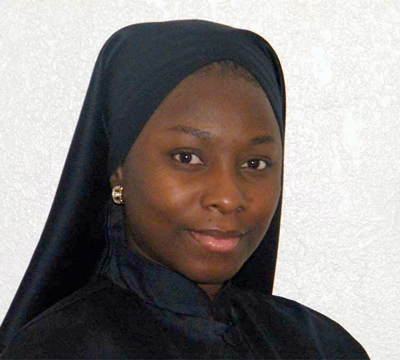 Even the youngest of them, Sister Amirah, I think she is around thirteen or fourteen but she is a very studious individual; and so I selected her for that purpose. I was also looking at their character, their demeanor, their overall expressions, and the level of energy they project. 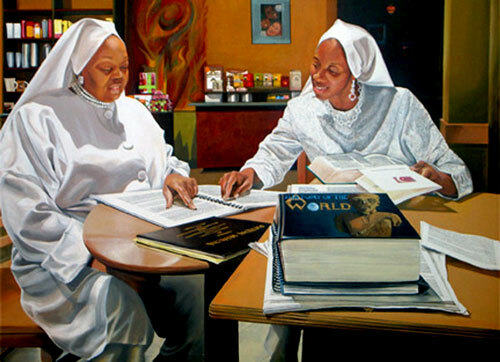 Because when Mother Farrakhan, Minister Farrakhan, and the family looks at this painting I hoped that they would see reflective in the sisters demeanor; facial expressions, bodily expressions and overall beauty appearance that which would be radiant and representative of the Muslim Girl in Training, the M.G.T. So, we looked at beauty appearance both internally, as well as externally. So everything about them had to be at best somewhat true to what we were attempting to illustrate in the painting. Yes, we have flaws and faults but still, I was looking for the best that I could capture on canvas from each of them which the overall M.G.T. class would agree is a representation of us. In order to do that I believed they had to be somewhat true to what we were trying to convey. BJ: What type of work did it take to complete this piece? Please share the behind the scenes. SM: It was something! When I started the painting I had a lot of projects and other things going on at one time. All the while I was fully energized and excited about everything I was doing. I had to work very diligently at finishing each thing including this painting. About two months away from Saviours' Day I started digging my heels in a little more. At MUI in Miami, I work with students in the performing arts and we were working without fail to have them perform a ballroom dance, ‘The waltz’, during the Saviours' Day Convention at the Children's Village, which they did beautifully. While multitasking and managing the various creative projects I was engaged in, I could waste no time and became really sleep deprived. I was on such a high that I didn't really take note of the physical wear and tear it was having on me. I would sleep maybe two or three hours and pop up during the wee-hours of the night full of adrenaline as I jumped back on the painting. I made it to Illinois on Wednesday for Saviours' Day. When I entered my hotel room I put my things away and didn't look at anything else but the painting. As I got started I ran into some problems with the materials to build the canvas. It turned out that upon the purchase of my supplies I was given the wrong size wood frame or stretcher bars which is the structure or framing that the canvas is wrapped around. I scrambled to fix the problem and ultimately I did with the help of a couple of F.O.I.s. Praise be to Allah! "Road Work: Art & Soul of a Man"
Friday afternoon I was with the children when they performed for the Children’s Village before Mother Khadijah Farrakhan and many others. Since I was so pressed for time with the painting, after the performance I immediately retreated back to my cave, the hotel room, as Sister Bernice, a parent of two of the children introduced them to Mother. I did not stop from that point until 5:00 AM Saturday morning just before the M.G.T Class. I was determined to deliver a valuable and beautiful finished painting to our class. Sister Caroline X and I, along with two other very helpful F.O.I. got the painting to the M.G.T. Class Saturday morning about 6:15 AM. Sister Sandy was anxiously but patiently expecting the arrival of the painting. And during the M.G.T. Class we presented it to Mother Farrakhan's daughters, Sister Donna and Sister Khalliday Farrakhan. Everybody's response was just so beautiful, so exhilarating. 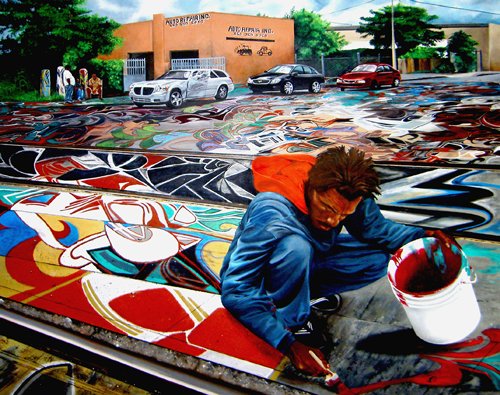 They were so appreciative and proud to see themselves, the M.G.T., so well depicted in a work of art, a painting. No one is going to tell our story as we will and should. We have to ask ourselves, if not us, who is going to tell our story or paint our history better than us? Who's going to write our songs and plays in such a light or in such a manner that is truly a representation of who we are, if not us? Who is going to put us out there in the world except ourselves? And so that's what I got from the M.G.T.’s response, and it just gave me an even greater high to do more. After we were dismissed from class, shortly thereafter I was called to the Children's Village to present the painting to Mother Farrakhan directly along with Sister Donna Farrakhan on behalf of our National Student Captain Sandy Muhammad and the M.G.T. Class. I had never been so close to Mother but when I had the opportunity to hug her she was so warm in spirit, so gentle, and so kind. She felt like my own mother. Her sincerity was so pure! After taking pictures with her along with the painting, I met and spoke with others who just wanted to talk about the artwork of which I enjoyed explaining. That afternoon I turned in and the next time I was aware of anything including myself was 3:00 AM, Sunday morning. I had been knocked out. That was the end of that story. I would not trade this entire experience for anything. It was priceless. Thanks to Sister Student National Captain Sandy Muhammad for the opportunity. I titled it “Seeded Minds: Year of the Farm.” Many people may look at that painting and they may not see where the title works with the painting. I was thinking that would be important to get them to see what that's all about. Firstly, what inspired me to add this title to the painting was the Honorable Minister Farrakhan, who said during a lecture, this year would be called “The year of the farm.” As I thought it through I considered the intense study the Minister had placed the Nation of Islam on, not just recently, but years of intense study on the lessons and the parsing of words. As well I considered the intense study the M.G.T. was undergoing in the M.G.T & G.C.C. Class. As I looked at the phrase, ‘The Year of the Farm” I knew he was speaking of the actual farming of land but I was looking into it a little deeper than just a mere farm--though farming is not a mere thing. It's very vital and very important to a nation and its people. But I saw in it the believers, the FOI and the MGT, but in particular the M.G.T. in this case as an expanse of earth, as farmland, fertile soil and the Minister as a Farmer who tills and cultivates the earth (the believers); planting seeds and producing crops ready for harvesting and the nurturing of life. Our minds and hearts are being seeded by the Minister in this way, with the knowledge and wisdom of God; this is the significance of the title, ‘Seeded Minds. Year of the Farm’. The Minister says he wants to unleash and send Saviours’ into the world and the course of study he has us on is critical. The seeds of knowledge he has planted and is nurturing in us are essential for the next phase of our journey. It is taking root, germinating, growing, and producing in us and our nation a great product, as the Minister says, “A Valuable Final Product,” constituting the qualities necessary for the salvation and deliverance of a dying people and world. BJ: What did Mother Khadijah and others say to you one on one about the finished product? SM: Sis. Sandy was really wowed and very impressed when she saw the painting. Even though she knows my work and ability, I don't think she expected to see what was presented to her based on her reaction. She just looked at me with amazement in her eyes. She said, 'Oh my God! You know, this is beautiful!’ She showed it to the M.G.T. student captains and officers who had the same reaction and sentiments as did the M.G.T. Class overall. There were those who mentioned producing prints for them. They were all so very proud of it and of me. It was really a humbling, yet elating experience that Allah had placed me in. I appreciated every moment of it. It was wonderful to share with the sisterhood the talent and gift that Allah has blessed me with and to be that example of allowing our light to shine; showcasing the rich culture and talent among the members of the Nation of Islam. We have great talent among us, and that's what I wanted everyone to experience, because we are the best! And so we have to put out the best. When I go out with a painting like that, other people that are not from among the Nation of Islam see that. I try to make sure they know that I'm from the Nation of Islam and this is the kind of talent and abilities and expressions that you will find in and amongst us. What the world is showing them of us is nothing of who we really are. How will they know unless we put the best of ourselves before them through the Nine Ministries established by the Honorable Minister Louis Farrakhan? Whether they come in or we go out to them we show them that beauty and growth that's emanating from us because of the work that goes on in our Nation. SM: May I share with you what motivates and inspires me to paint? SM: I am motivated and inspired to paint Allah’s creation, humanity and nature. When I take an idea or a concept that's a real life issue, an aspect of the world around me, and find beauty in it, I capture it on canvas and develop it into a beautiful work of art this is exhilarating. I can never take full credit because the rendition is only a snapshot of the work of Allah. So when people marvel at what I do, I am reminded to give all the praise to Allah (God) as I say, thank you. And I mean "Praise be to Allah” with all my heart because what they are admiring me for doing has already been done, it exists all around you and me. The world we see and experience, the creation, and the universe, humanity and nature is a well established masterpiece in itself, a living work of art. That is not our doing; it is Allah’s Artistic and Creative Genius, His masterpiece, ‘The Art of Creation.’ Whether we write poetry, sing, or dance, regardless of what we do in life we are merely duplicating or acting out what He has placed in the world and in each of us of Himself, that is the beauty of Allah's Expression in you! BJ: Are there any plans of doing maybe an exhibit or a tour? SM: I am currently working on a few new paintings. On June 24th thru the 26th in Chicago Illinois, at Muhammad University of Islam Brother Faraad Muhammad, Student Chair of MAC stationed at Mosque Maryam, along with members of the Ministry of Arts and Culture throughout the Nation are organizing a very exciting conference, benefit dinner and concert for the first annual Ministry of Arts and Culture National Conference. With Allah’s help I plan to show my next paintings there. One is entitled “Peacemakers: Sun Rise in Over Town.” For more information on the conference go to: www.ministryofartsandculture.com. BJ: Thank you so much for your time and for this inspiration! Those are some beautiful painting sistahs. May God continue to bless all of you. Man this is soooo powerful! Her words, her talent are both truly inspirational. I wish we could see and hear more about the things the believers are doing all over the world in the Final Call; maybe even have a section reserved just for that. Help us to NETWORK with the people in our own community. How else can we find things out like this. Thank you bother for sharing yourselves with us. I needed this for sure. As always, our Brother Jesse did a fantastic job with the interview. May ALLAH bless you both to continue self improvement. Praise Be To ALLAH! the most beautiful artwork i have ever seen! May Allah bless yall. All Praise is Due to Allah. I did not even realize it was a painting at first. Beautiful! I am impressed not just by the naturalistic appearance of this wonderful artwork.But also the warm,depth,insightful,mind and spirit of Sister Shernett Muhammad.Allah has truly given her a most valuable gift. Allah has truly blessed you! Thank you for sharing. I used one of the paintings for my MGT manual! I Love, Love, Love, Love These sister.